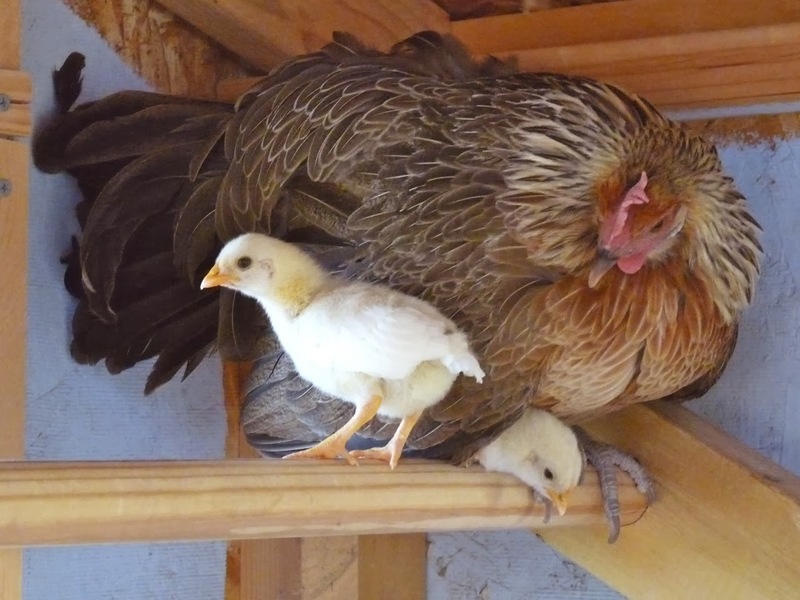 Cagney, our Phoenix hen with her chicks. We're also updating the duck flock. The Khaki Campbells we currently have enjoy a reputation as good egg layers, but appear to have no mothering instinct whatsoever (with possible exception of Moe, but no definitive proof yet). We're adding Welsh Harlequins to the flock: they have Khaki Campbell in their bloodline, but also have nesting/motherhood instincts. Much easier to add to the flock when you can "let mama do the raising". The geese? 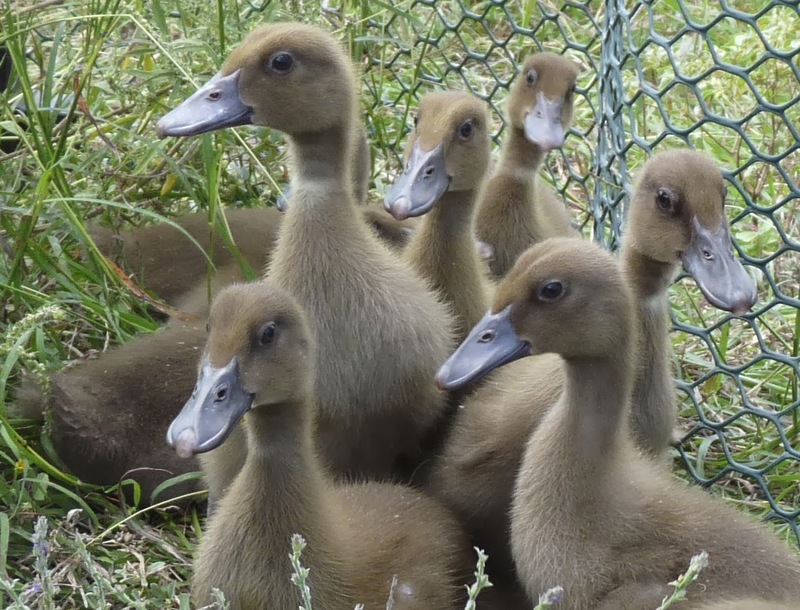 They can live and lay eggs well into their 40's, and what goslings they do raise can be mean bast*rds from what I've been told, so we're just gonna stay happy with what we have. Khaki Campbells from 2010, just a few weeks old. The night-time duck pen will be easy enough to expand, but the chicken coop will require some modifications. We'll probably take down the shelving to create space for more roosts. We currently have in place a 10-space nesting box, and have a three-space nesting box in reserve that we can add if necessary. We could also build a six-space box out of wood, there's plenty of online plans. I went ahead and ordered duckling-specific starter feed. Some say you can feed ducklings chick starter, but from what I've read, ducklings have higher niacin needs. Since we want the females to be long-term layers, I'm thinking it's better to start them out on the best chow possible. I'll later transition them to the organic chicken chow with supplements once they mature. I'm oddly nervous about raising a new flock from scratch. It's been a few years. We should receive both the ducklings and the chicks by the end of February. [Expect many pictures and much squeeing upon their arrival.] Timing it thusly, they should be feathered out and ready for protected outdoor pens (until they're large enough to be integrated with their respective flocks) by end of March at the latest, which is two weeks after the last average frost. Fingers crossed that there may be a rooster from the bunch that can get along with Lucky and be spared the ax. There will be no shortage of females for their harems! Lucky the Roo. He's a right handsome bird, he'll have you know. The biggest event since last post has been The Flood. Our area received eleven inches of rain over a single night, ripping up the roads within AND leading out of the community. Spouse and Uncle brought in a few loads of roadbase right away to patch up our biggest ruts, but we ended up needing three more dump-truck loads to complete all the needed repairs. Our next-door neighbor was a tremendous help, loaning his time & tractor skills not only to repair our culverts and rutted road, but also assisting other neighbors, and doing what he could to temporarily shore up the community road until we all finish fundraising for a pro fix. If it weren't for him, we'd still be 4x4'ing to get anywhere. Thank you D. (and spouse T. for letting him! ), more "spontaneous" smoked ribs coming your way! In the category of "Hopes & Dreams", the first seed catalog to arrive this season was Good Seeds from Baker Creek Heirlooms, right before Christmas. Second in the mailbox was Bountiful Gardens, the gold standard for everything heirloom, untreated & open pollinated. I've put in a catalog order for Southern Exposure Seed Exchange in hopes of more varieties that will work well in our semi-arid region. Our "average" last frost is in mid-March, and if I want any Summer tomatoes at all, I'll need to start seedlings in early February. 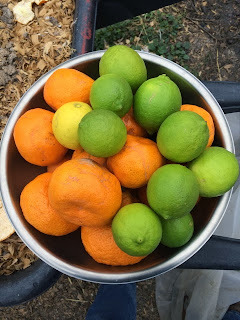 While the garden may have been an epic FAIL in 2013, we had a nice Winter harvest of citrus. There are still some fruits ripening on the trees, but initial harvest of limes gave us enough for two ice-cube trays full of juice, which was promptly frozen & stored for future use. Other limes were used fresh for personal libations, on those few porch-sitting, warm weather days. Spouse shored up & modified our old kit greenhouse to accommodate the taller citrus trees. The structure has done well by us: it's been a greenhouse in the Winter, and secondary duckpond structure in the Summer. We really need to get a bigger, sturdier greenhouse built in 2014, however, as this one is on its last legs. 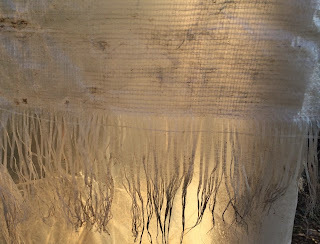 The plastic joiners can only be repaired so much, and the geese have chewed the edges of the plastic tarp cover to ribbons. The chickens started their annual egg-laying slowdown around late August, and all but two hens went on outright strike until the other week. Our girls are getting older, but even the youngest (who are less than 2 years old) said "meh". Of course, when the light wanes the girls lay less by nature. We could put a 12-hour timed light in the henhouse, which would trick the girls into laying a few more eggs during Winter... but, nahh. Just two weeks after Solstice, however, the two youngest girls started adding to weekly egg tally, and I'm guessing by late February, we'll be back up to a decent production, enough to sell again. May get a handful of Welsummers to freshen up the flock this Spring. 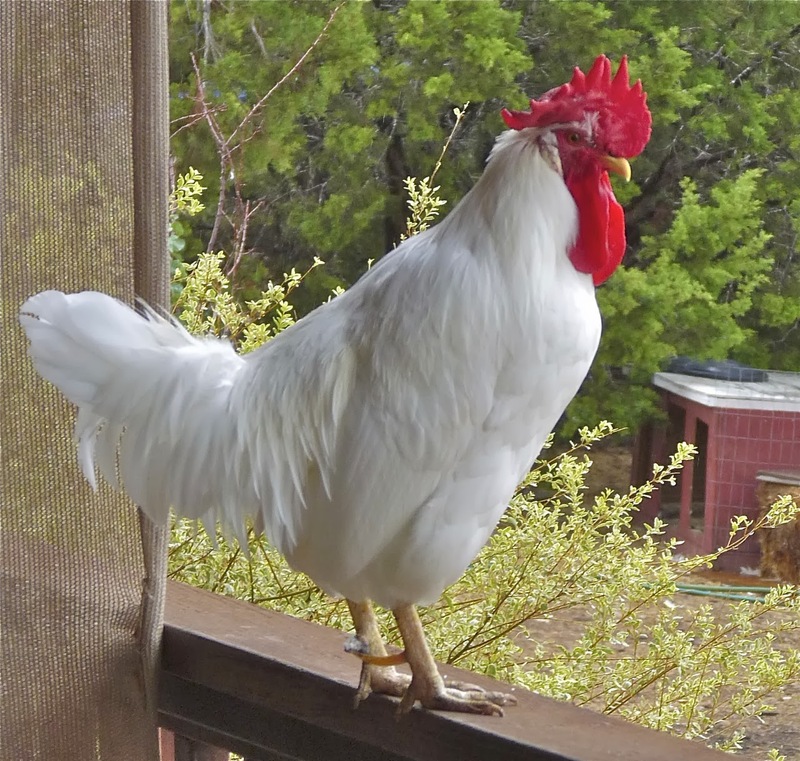 Had high hopes the Welsummer rooster would work out and give us a few pretty babies, as Lucky's progeny turn out too flighty for my preference, but Lucky the Leghorn rooster Did Not Want. The two roosters fought until bloody, with Lucky getting the worst of it. Lucky ultimately won the war by virtue of being a known good roo to the ladies. The Welsummer was shipped off to a new home. 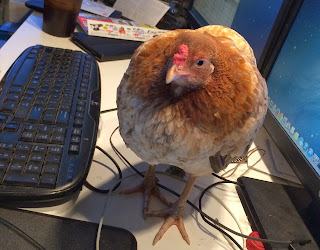 Perhaps I'll wait for another rooster & homegrown chicks after Lucky retires to the henhouse in the sky, so to speak. Speaking of chickens, we did lose one of the Pecking Order Enforcers from our first hand-raised flock, the small yet mighty Nutmeg. She'd been slowing down for a couple of months, and (what turned out to be) her last two weeks I'd bring her inside the house at night, where it was warmer. During her last week, she'd walk towards the house at dusk instead of the coop, and wait for me to bring her inside. She was the only hen that Bandit the dog would willingly share morning breakfast. She is survived by her sister Cinnamon, and two others of the original flock. We will miss her. Now that Bandit's been mentioned, I must report that most of our savings for a garage has been spent on getting her knees repaired - yep, both back knees. One blew out late Summer, and the other right before Thanksgiving. It's a good three months of rehab (thankfully, we can do that for her ourselves), then three more months before the knee is solidly healed. Not that I know all that much about joint repair and rehab, mind you. I'm not bitter, I swear. We still have the full flock of ducks: nine hens, and one drake. The ducks experienced a major egg slowdown like the chickens this season, then egg production rose these past few weeks as well. I'm on the lookout for paperboard duck-egg cartons, so if you happen to see any in your 'net wanderings, drop us a line in the comments? Gracias! 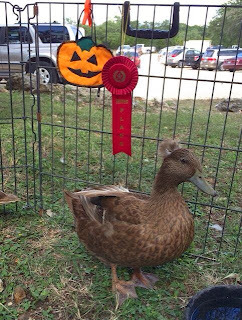 Queen Moe had a moment of stardom this Fall when she won Second Place (in the "exotics" category) at a Pet Costume fundraiser for a local convalescent center. I whipped up a pumpkin cape for her back, and prayed no-one would judge for quality stitching. She beat out a horse painted like Nemo the clown-fish, but lost to two small children who painted up their hermit-crab aquarium so their crabs looked like they lived in an undersea world. [One friend mock-huffed "ageism!" Never compete against small children with pets*, or something like that.] Moe was a right trooper, letting herself be carried to, and petted by, all the seated patients in attendance. Her Majesty let me know she was ready to go home by tugging on my shirt towards the end of the event. Not sure where the video of her doing the shirt-tug is hiding, so the pic with ribbon award will have to do. Last, but not least, we're now preparing for the arrival of Extreme Goose Crabbiness, also known as Goose Egg-Laying Season. There have been signs, such as heightened annoyance (versus regular annoyance) when anything non-goose gets near, and some of the ladies have been seen checking out the undersides of bushes and other likely laying spots. No synchronized head-bobbing in the Pool o' Woo yet, nor any gander battles either, thank goodness. We wait with bated breath, chewed fingernails, and protective gear at ready.